and another thing is u need to scroll to the app screen and search through the apps to just make a phone call. Wth can't they just make quick launch icons for this like ios and android. LP, 27 Jun 2011Awsome design. But why ther's no xenon flash for camera? anyway hope this will be a huge comin... moreit has a dual led flash which is 20% more powerful than the most powerful led flash Thats available. no cord slot. 8mega pix cam..
And GPU oldest... GPU from iphone 2g!! and games ?? Couldn't care less. I have the N8 and I am sure it will be the last Nokia that i will buy. Nokia over the recent years have shown that it is an un-caring company to its loyal customers and workers. Just look at how Symbians is treated. I also have the Samsung Galaxy S and couldnt be happier with it and Samsung. 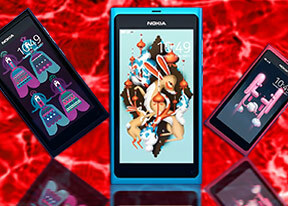 Will n9 be coming to india or not,plz someone tell me...?? every day the phones are geting better but a lot of us are not happy what we want ??????? Mark, 27 Jun 2011Your mistake is that for the N9, the OS is irrelevant. It runs Qt. The Qt apps that run on my ... moreHow many of the general public because this is who phone makers are banking on know about Qt? Most people who get this phone will go to the Ovi store and will be greeted with what is it 168 Qt means nothing to them. Bailey, 27 Jun 2011I love how people keep calling Elop a Troll. Nokia is a businees i know that does not mean any... moreYour mistake is that for the N9, the OS is irrelevant. It runs Qt. The Qt apps that run on my C7 will run on the N9. I already own the apps I want to use on the N9, how could that possible be a problem? Quote from front page of gsmaarena,,"the N9 camera archtecture is fully open". F2.2 plus get camcorder pro cooking on this beast..
Oh and N950 developer smartphone has 12MP camera..